A very exciting development in fireworks recently has been the launch of a number of firing systems aimed at consumers. These enable the remote ignition of fireworks safely and without modifying your fireworks or their fuses. The systems now on the market which are aimed at consumers differ from larger professional systems in two main areas. Firstly, the igniters are designed to clip on to existing safety fuses on your fireworks. This is important because it means that no modification or cutting of your firework’s fuse is required. Simply clip the igniter on to the firework’s external green fuse and it is ready. Secondly, consumer systems are much simpler and do not require complex wiring or setting up. The trade-off being a limit to the number of fireworks you can fire in total without having to rewire. With a professional system you can wire up a whole show – literally hundreds or thousands of items – but with a consumer system you will be limited to a few dozen or so. Still, that should suffice for most shows or even firing off just your finale remotely. There’s also no reason of course why you cannot buy a number of consumer systems and use these together however this will add to the cost. Another feature of the systems covered in this article is remote ignition. This means no wires between the remote detonator the fireworks, which are wired up in groups to a base station. The main system of interest on sale at the moment which features remote ignition and external fuse clips is called Launch Kontrol. There are a number of different versions of this unit available with the most advanced being able to control four independent base stations, each with five fireworks attached. This enables you to connect 20 fireworks in total. 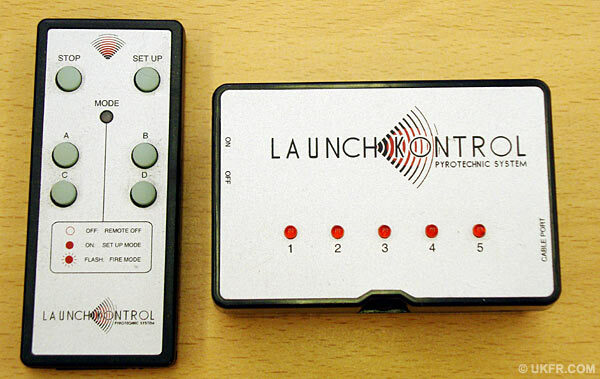 The more advanced Launch Kontrol with independent firing of up to four base stations (right) from one remote control (left). Photo with thanks to Firework Emporium. The fuse clips on this system are specially designed to clip on to your firework’s existing fuse, removing the need to cut or modify your firework. The remote controls typically work over the same distances as the firework’s safety limit meaning you could, literally, fire your display from the audience. As with professional systems each electrical igniter can only be used once and then you need to replace it with a new one. In this type of system the igniters come in sets of 5 on a ribbon cable. The electrical igniters in this system are numbered and clip onto the firework’s external fuse. Photo with thanks to Firework Emporium. These systems are still relatively new and it is hoped that other systems will be available in due course which may expand on the number of fireworks you can fire at once, or implement a hard wired system rather than a remote. Fire your fireworks from a very safe distance. Reduces the need for protective clothing if you are firing from some distance away. Enables the rapid firing of a chain of fireworks. Gives you, as the firer, an opportunity to sit back and watch your show! These systems can be purchased from most major fireworks retailers. Remember if you use any of these systems you should still have a hand firing back up in place. One area of interest which UKFR is following is the potential of “hybrid” systems. This is where a consumer-orientated fuse igniter is used but with a professional style firing system. This has the potential of being the best of both worlds for the consumer – safe ignition of fuses without any firework modification and a potentially unlimited number of fireworks which can be connected per display. At the time of writing UKFR is looking into the potential of these systems or the practicality of mix and matching consumer e-matches with professional firing systems, so watch this space or pop over to the UKFR Fireworks Forum and search for information there. Companies who supply firing systems of various types and sizes can be found listed on the Fireworks Firing Systems page. Our busy UKFR Fireworks Forum is an ideal place to chat about firing systems too. We have lots of consumers now using firing systems who can answer any questions or make recommendations. For those in the trade, we also have a Professional section where users of the big systems such as Cobra, Merlin, Easy Pyro, Fire By Wire (MLE’s FBW), PyroMate, Fire One and others are on hand to advise. Registration is free and open to anyone in the UK.